No matter how you say it, I love them. I wasn’t aware of how much I did love tomatoes until a few months after I married my first husband and he said “ Do we have to have tomatoes or tomato sauce tonight for dinner?” I’m sure I looked shocked! What???? 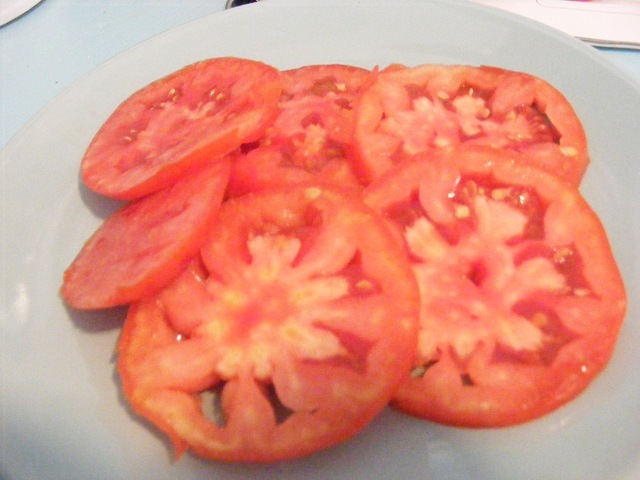 It’s summer, we are supposed to eat tomatoes. 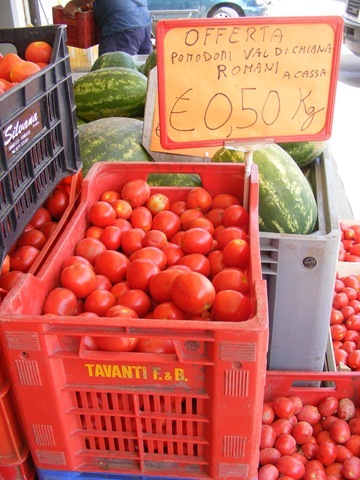 Then he went on to say that he could always tell what time of the month it was because all of a sudden, every meal would contain tomatoes in some form (fresh, sauce…) and a starch (potatoes, pasta, bread…). I didn’t realize that either. Well, those hormones that controlled my dietary needs have long since flown the coop but every now and then I still have this very strong urge for tomatoes and a starch. 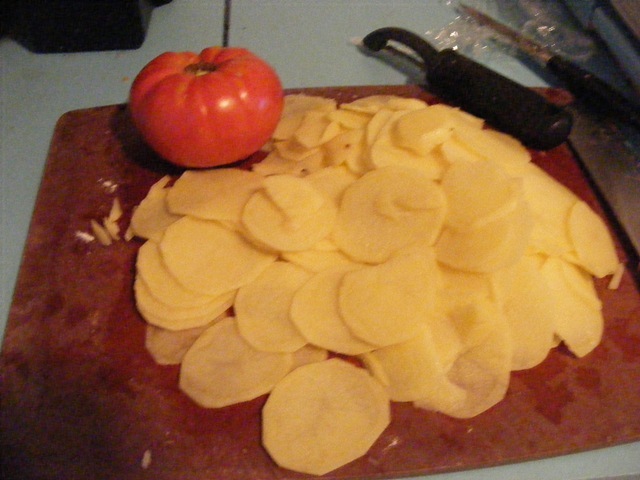 So the other night it was home made potato chips to go along with sliced tomatoes. 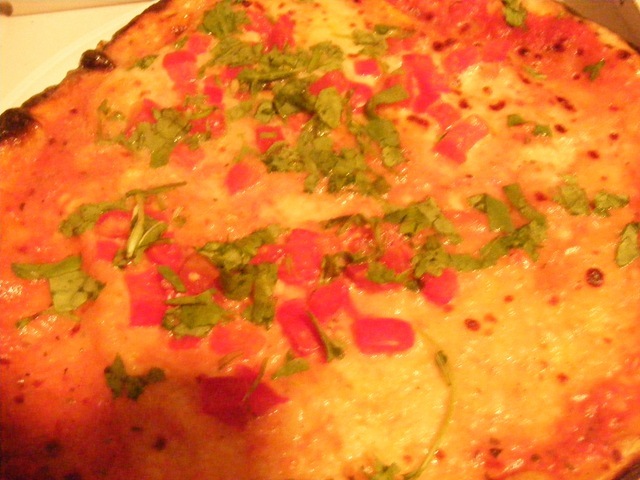 pizza from the pizza sagra, with fresh chopped tomatoes on top of it. Why am I so focused on tomatoes? Well they are growing all around us here. Look at this one that weighted over 2 pounds. I saw this at the Indian man’s fruit and veg stand. And the other day I saw 2 large semis going past, filled to the top with freshly harvested tomatoes, on the way to becoming sauce. Just like these. The other fruit and veg vendor that I shop at is full of containers and containers of them. These are roughly 35 cents a pound. 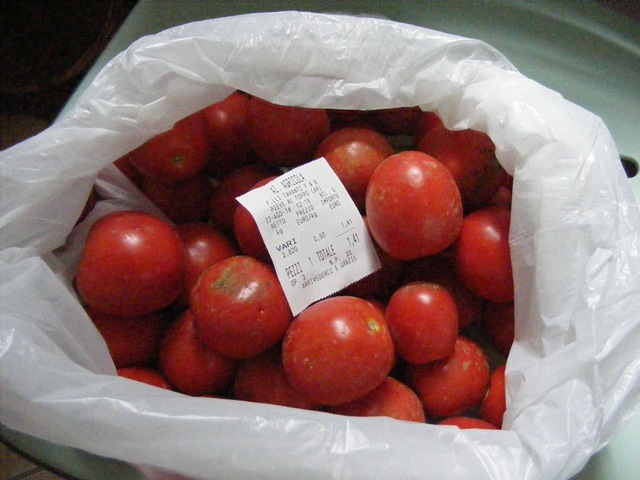 I bought some and made the tomato jam recipe that was in issue #130, Aug/Sept of Fine Cooking magazine. The ‘jam’ turned out okay. 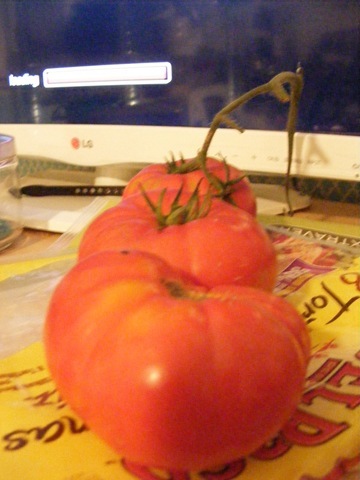 I probably will like it better in the middle of winter when I don’t have fresh tomatoes coming from my garden. I have 3 plants, 2 of which are doing very well. 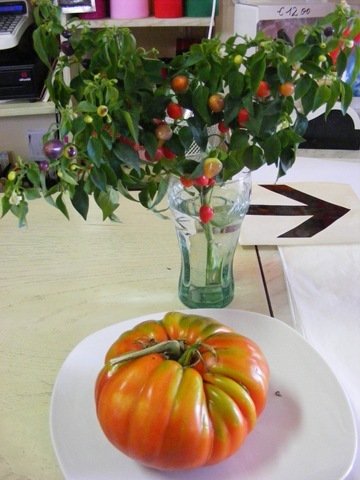 One beefsteak and one cherry. They have an honored place to rest, by the TV. 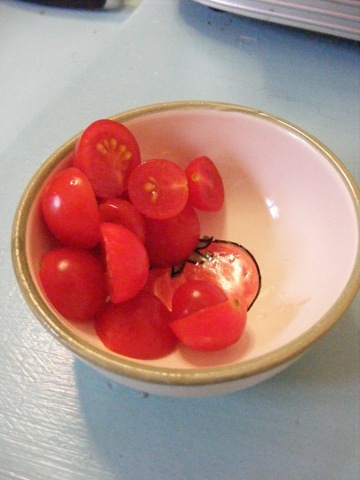 The cherry variety are served in their own little bowl. 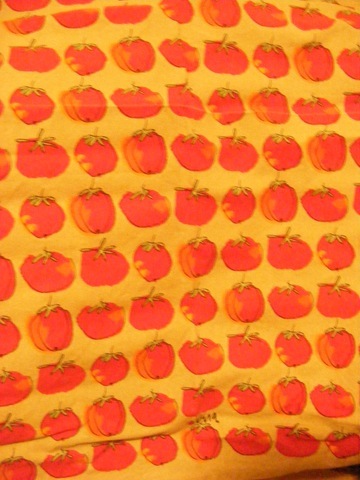 And I have a tomato dish towel… so maybe I do go a little tomato crazy.